iPhone iBooks to Computer Transfer - Transfer ePub, PDF, Audiobook from iPhone to Computer. 3herosoft iPhone iBooks to Computer Transfer is the best iPhone iBooks transfer software which can transfer ePub, PDF from iPhone to Computer for backup in case your iBooks or multimedia files are lost or damaged. For the purchased books on iPhone library, it also allows you to transfer them to computer or sync them to iTunes library. Additionally, iPhone iBooks Transfer can let you add music, video, podcast to your iPhone and also transfer those files to computer local, sync to iTunes library. And Now fully support the latest iOS 8 and iTunes 12. And the software with high compatibility can apply to all types of iPhone/iPod/iPads including iPhone 3, iPhone 4, iPhone 5, iPhone 5S/5C, iPhone 6/6 Plus, etc. Even you can check the iPhone library files as using a portable device while is connected to computer. Transfer ePub, PDF, Audiobook from iPhone to computer for backup. Allow you to transfer the purchased/free downloaded books(ePub, pdf, audiobook) on iPhone iTunes store to computer local or easily sync them to iTunes library. 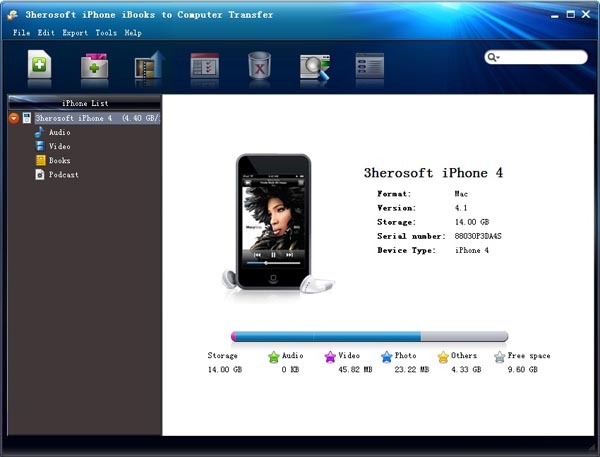 Transfer iBooks (ePub, PDF) files to from local folder to iPhone/iPad/iPod touch with iOS 5.0 or above. Transfer Music, Video, Podcast, TV Show, Playlist from iPhone to computer and sync them to iTunes; Allow you to import music and video to iPhone library without iTunes. Open your iPhone 3, iPhone 4, iPhone 5, iPhone 5S/5C, iPhone 6/6 Plus with Explorer like an external hard disk.